Skyworks Unveils Connectivity Solutions for Emerging Automotive Platforms | Skyworks Solutions, Inc.
IRVINE, Calif.--(BUSINESS WIRE)--Dec. 5, 2018-- Skyworks Solutions, Inc. (NASDAQ: SWKS), an innovator of high performance analog semiconductors connecting people, places and things, today introduced its suite of next generation SkyOne® Ultra 3.0 devices specifically designed for advanced automotive applications. Skyworks’ newest wireless solutions are derivatives of the Company’s highly successful SkyOne® cellular platform, delivering robust, low latency, high bandwidth LTE connectivity in addition to extended operating temperature ranges and production lifetimes. The portfolio exceeds LTE CAT 16 requirements, is scalable to 5G new radio standards and supports all global cellular bands. Given their compatibility with all leading chipset providers and a simplified compliance process, these highly integrated architectures are being adopting by customers to reduce design complexity as well as time to market. Embedded navigation systems, diagnostic capabilities, personalization services and other smart features are fueling consumer demand for connected cars. In fact, IHS Markit forecasts that worldwide sales will increase from 24 million units in 2015 to more than 72 million by 2023. Placing this growth in perspective, in eight years nearly 70 percent of the passenger vehicles sold will be transmitting data with external sources, bringing new services and business models to automotive markets. SkyOne® Ultra 3.0 incorporates the key analog and RF functionality in both transmit and receive paths of LTE communications. Transmit devices contain power amplifier modules with SkyBlue™ technology for improved efficiency, as well as integrated duplexers (PAMiDs), low noise amplifiers (LNAs) and antenna switches. Diversity receive (DRx) modules combine the necessary components within the LTE receive path including LNAs, filters and antenna switches. The complete cellular solution is contained in a package of less than 40 mm x 40 mm, a critical element in meeting automotive-qualified network attached device (NAD) reliability requirements. Further, the connectivity engines can be regionally optimized for North American, European, Chinese and other SKUs to achieve additional cost savings. 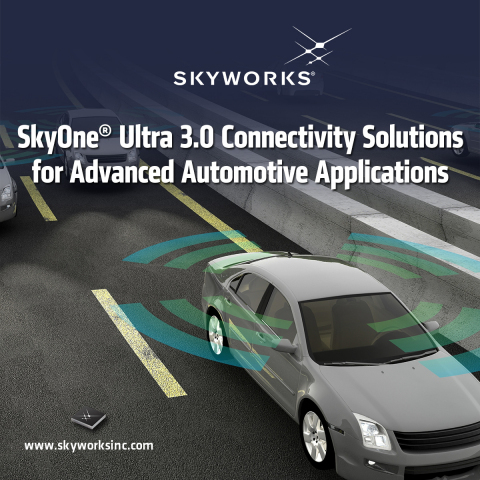 For more information, please contact: sales@skyworksinc.com or visit our SkyOne® Ultra 3.0 for Automotive page.